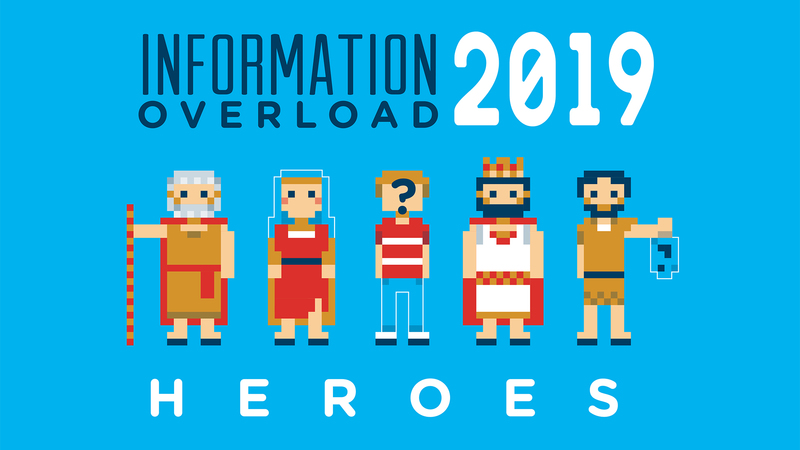 Registration for Information Overload 2019, our middle school retreat, is HERE! Information Overload is a fun filled, Bible deep middle school retreat that exists to equip students for life through large group teaching and small group discipleship. In this year’s “IO” retreat, we will use over 40 different skits infused with a main teacher to walk through the Bible and it’s heroes. This weekend proves time and time again to be an amazing time of growth for students as we get away from everyday pressures and distractions. Click the register button below, which will bring you to register online. You will fill out all the necessary info there, including online payment and download blank waivers. To complete the online registration, a $45 deposit is required. WHEN: Friday, April 12, 2019 at 7 p.m. to Sunday, April 14, 2019 at 10 a.m.
PRICING: $145 per person. (includes meals, lodging, games, student packets, and a t-shirt). QUESTIONS: Contact Morgan Sain at msain@dentonbible.org. When and where is check-in on Friday, April 12? Check-in at Camp Copass will be from 7-7:45 p.m. Camp Copass’s address is 8200 East McKinney Street, Denton, TX 76208. Once you pass through Camp Copass’s front gates, there will be signs directing you where to park and where check-in will take place. Please make sure your student eats dinner beforehand (or brings it with him or herself). What will check-in look like? First, expect there to be a line a check-in, so we thank you in advance for your patience! And we won’t be able to begin check-in any earlier than 7 p.m. So if you arrive early, feel free to start the line outside the glass doors, which will open at 7 p.m. on the dot! At check-in, we’ll, of course, check your student in so we know he or she is present, and we’ll also make sure your student has sufficient waivers, payment, and provide your student their IO t-shirt! As a parent, what do I need have ready for check-in? Payment and waivers. Both may have already been completed/turned in before arriving to the retreat, which will make check-in a little simpler for you! If you haven’t turned in your waivers or completed payment, we need to collect those at check-in. The waivers are available as an attachment to this email if you’d like to fill them out before arrival, and we will also provide blank waivers at check-in. Can someone check-in my child for me? Absolutely! We will just need any remaining payment and/or waivers if they haven’t been turned in before check-in. Can my student check-in him or herself at check-in? Absolutely! Again, he or she just needs to come ready with any remaining payment and/or waivers if they haven’t been turned in yet. Can I turn in any remaining payment and/or waivers prior to check-in on Friday? Yes! If you plan to get them in before check-in on Friday, please do so by Thursday at the latest. You can email the waivers to Morgan Sain directly at msain@dentonbible.org. Or turn them into the DBC front office during their office hours (M-Th 8:30 a.m.-5 p.m.). When do I need to pick up my child on Sunday? At 10 a.m. on Sunday, April 14 at the same place you dropped them off on Friday. Does my student need to bring any additional money for the trip? Nope! All meals on Saturday and breakfast on Sunday morning will be provided. My student has a food allergy, what should I do for him or her? Great question! Morgan will send an email to those who listed any kind of food allergy in their registration closer to the trip. It will include what meals will be provided, what Camp Copass does for accommodation, and more. So be on the lookout for that email! If my student will need to miss at any point, do I need to let you know? YES, YES, YES! If your student will be arriving late (after 7:45 p.m. on Friday), please let us know beforehand so we know to expect him/her late! Email Morgan Sain at msain@dentonbible.org. (If you let us know when you registered online, no need to let us know again!) If your student will be leaving at any point during IO, at check-in you will need to provide what times your student will be gone. Phones & iPods are welcome, but each student is responsible for his/her belongings and these items are only to be used at appropriate times.